For those seeking a versatile, powerful speaker package to blow them back into their seats, you won’t go far wrong with Whale Speakers. Glossy finish, Plush Looks with unique LED Display and Powerful sound, the speaker has it all covered! The heavy duty hits the sound with an exciting, dynamic performance that’s powerful and immense. With 180WattsRMSfilling the room with theater-quality sound, the speaker with 8inch Subwoofer and front firing woofer with bass reflex technology and with audio crossover delivers big, bold and enveloping sound with bass reflex enclosure, smooth midrange and a nearly tangible sense of space. Housed in a superior wooden cabinet, the speaker enhances low frequency sounds while sparking high frequencies for bold and dynamic treble with a heart thumping bass. Generating voluminous sound from minimal dimensions the 3 way speaker is capable of handling both quitter scenes and outbursts of action with minimal distortion, even at louder listening levels. With several connectivity options, the Whale speaker can be easily connected to various media devices using Bluetooth that lets you enjoy your favorite music wire-free. 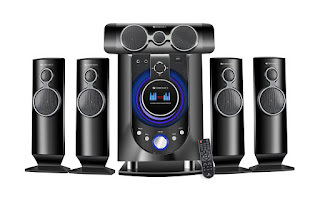 The speakers also support USB, SD, FM with 50 channel support or MMC cards, MP3/WMA format to play your choice of music. Paired with fully functional remote control, the speaker is already available with leading retail stores across India.